VEGAN MANGO CHEESECAKE! 💛🌟Oh I absolutely LOVEEE this one! It's SUPER delicious, simple and also is GREAT to make in advance, freeze and take out when you have guests or if you want a healthy treat! I used frozen oob organic mango with chickpeas to make the smooth "cheesecake" section & the flavours are delicious! This recipe is vegan and organic! Boil water and soak dates for 5 minutes before draining. In a strong food processor, add drained dates, walnuts, 3 tbsp. of maple syrup and 3 tbsp. of desiccated coconut. Blend until a chunky, but sticky paste. Spray a muffin tin with coconut oil to ensure nothing sticks. I used a silicone muffin tin so its super easy to pop out. Using around 1 tablespoon of mixture, press firmly down on the bottom of the tin to form a base. Set aside. Wash and clean food processor, ready for the next round of use. In the food processor, add cashews, 3 tbsp. of maple syrup, coconut milk and the remaining desiccated coconut. Blend until a SMOOTH consistency, this make take up to 10 minutes. The smoother the better, you don’t want a grainy mixture. Add the mango in after 5-7 minutes and continue to blend until super smooth. Once smooth, fill the remaining space in the muffin tin to the top. Freeze overnight with cling wrap and remove 30 minutes before serving. Serve with another dash of desiccated coconut and some more mango! 1 cup frozen or fresh chopped strawberries (or raspberries are great too, and I use the brand oob organic). 1. Place the desiccated coconut into your blender and blend until as fine as you can make it. 2. Add of the remaining base ingredients into the blender and blend until well combined. 3. Line a springform cake tin with baking paper at the base, and then press down the base ingredients evenly. 1. Blend all ingredients apart from the strawberries until extra creamy and delicious. Taste the mix to ensure the sweetness is to your liking. 2. Remove 1.5 cups of the mix and set aside. 3. Add the strawberries and blend until completely smooth, and pour over the base. 4. Allow to set for roughly 30 minutes, or until only slightly firm. 5. Pour the vanilla topping over the strawberry mix, and using a small knife, tooth pick, or end of a spoon, swirl the mix around so the strawberry and vanilla mixes somewhat combine and make a swirl effect. Create a pattern you like! 5. Place in the freezer to set, which may take roughly 2 hours. If it is completely solid, allow it to thaw slightly, and using a hot knife (run under hot water for 30 seconds), gently slice a piece. How could something possibly be so exciting? A Rocky Road that is seriously gut healing, good for your skin, detoxification, energy, will enhance your mood, and keep you satisfied for eternity (kinda). Firstly you must make the items that need to set; the jelly and the marshy. These need to set in your fridge for 1-2 hours, so get started on these and then worry about the chocolate and macadamia nuts. 1 cup thawed organic raspberries (if there is juice from the raspberries from thawing, do not discard and just include it with the mix as it will intensify the flavour) I use the brand oob organic. 1. Blend 2 cups of the water with the raspberries on high for at least one minute. If using a granulated sweetener, add to this mix as well and blend with the raspberries. 2. Using a strainer or a muslin cloth, pour the blended mix through and into another bowl and discard the seeds. Keep the strained mix reserved just for a moment. 3. Combine the gelatine and the remaining 1/2 cup of water to 'bloom' the gelatine. This means that the gelatine will absorb the water and become a thick mass. 4. In either your Thermomix or a low heated saucepan, add the gelatine mix and just a splash of the strained raspberry mix to heat through the gelatine so it dissolves/melts. Continue to stir through until well combined which will not take long. We are only adding a splash of the raspberry mix because we want to keep the nutrients in the raspberries in tact, for example heat destroys vitamin C.
5. Remove from the heat, and pour the gelatine mix into the remaining raspberry mix along with all of the remaining ingredients. Stir until fully combined, have a little taste and decide whether you want to add a little more lemon or sweetness. 6. Pour the mix into a tin or container lined with baking paper, and place in the fridge to set. This will take a couple of hours. Note: this makes a fair amount, so you will have some leftovers to nibble on or make more Rocky Road in future! 3 Tbsp Lakanto, or 20 drops liquid stevia, or any other sweetener to taste. 1. In a saucepan, combine the gelatin and water, allow to sit until the water is absorbed by the gelatin. 2. Add the remaining ingredients and stir. 3. Heat the saucepan to a low heat, and then stir consistently until the gelatin has completely dissolved and it looks just like liquid. 4. Remove from the heat, and allow to cool to just above room temperature. 5. Place in your blender and blend on low to medium speed for 20 minutes, or until it is quite firm and fluffy, and resembles the below photo. If you have a Thermomix, I blended it with the butterfly inserted, on speed 4, for 20 minutes. 6. Line a flat container or tray thick enough for however thick you want your marshmallow, and then pour the mix in and smooth out with a spatula. 7. Place in the fridge to set, which may take 1-2 hours. 8. Once it has set, eat some! If some gelatin liquid has settled to the bottom and formed a jelly, as you are chopping into pieces for the Rocky Road, just slice that bit off. It happened to me the first time I made it, but I realised I needed to blend it longer which is why it is 20 minutes. All blenders/mixers will be different. 1. In a bowl, mix the ingredients together well until completely smooth, set aside. 1. Preheat oven to 180 degrees celcius. 2. Place nuts on a flat tray and bake for 10 minutes, or until golden brown. 3. Remove from the oven, and set aside to cool. 4. Chop into smaller pieces if desired, ready to add to Rocky Road. 1. Once the jelly and marshmallow are set, and the macadamia nuts are cooled, chop everything into pieces in the size that you desire. 2. Line a couple of loaf tins, or a large thick tray. 3. Scatter the different ingredients evenly in the tray(s), mixing them through so you get a a good combination in each bite! 4. Drizzle the chocolate over the top of the ingredients, ensuring the top of the ingredient pieces are only JUST coated. Use your hands to mix everything through evenly. 5. Set in the fridge for 30 minutes to an hour, slice, and enjoy! 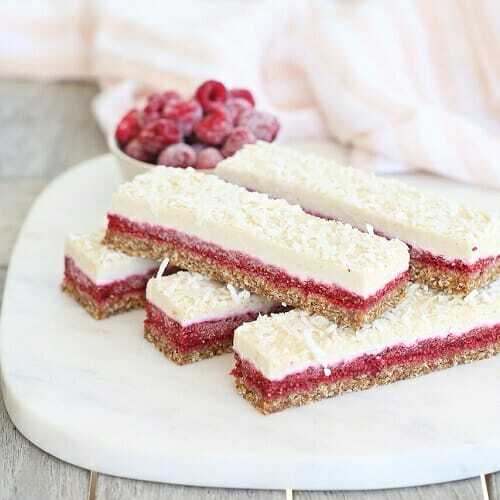 Anthea is a food blogger and owns a raw vegan cake business in Canberra, Australia. She loves sharing colourful vegan recipes and creating food for people. For the base, add the almonds to a food processor and blitz until broken down. Add the drained dates and ginger and blitz until combined. Press firmly into a lined 15cm loose bottom cake tin. For the filling, add the cashews, cream, oil, syrup and cacao butter to a high powered blender and blend until extremely smooth. Pour out half of the mixture into a bowl. Add vanilla bean powder, mix with a spoon and pour into cake tin. Set aside in the freezer until dry to the touch. Add the oob organic Smoothie Mix to the blender with the remaining cheesecake and blend until combined. 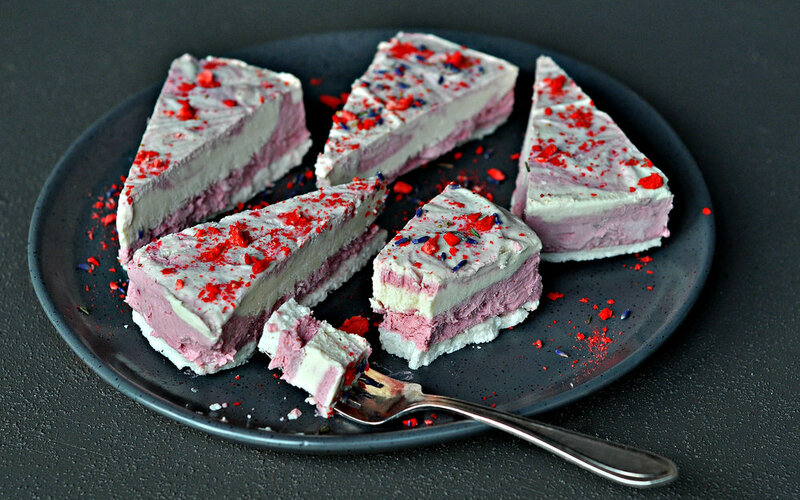 When the vanilla layer has set, pour berry cheesecake mixture on top reserving about 1/2 cup for decoration. Remove the cake tin from the freezer and remove the cake from the tin. Use the remaining cheesecake to decorate the cheesecake as desired and add fresh fruit. Enjoy immediately or store individual slices in fridge for up to 5 days or in the freezer up to a month. Freeze overnight, slice into bars and serve. Notes: The guar gum is optional, so you can make without and they’ll still taste delicious, but I’d recommend using it if you can, as it helps to give a traditional creamy ice cream texture, rather than them turning icy. Base: In a food processor or high speed blender, blend all base ingredients, excluding dates, until finely chopped. Then add the dates and blend again until you can press the mix together in your fingers and it sticks. Pour into a lined baking tin, press until firmly packed and flat, then place in the freezer to set. Raspberry layer: Blend the raspberry layer ingredients in a blender or processor until fully combined and like a liquid. Pour on the base and spread to flatten, then place in the freezer. Topping: Blend all topping ingredients except the coconut oil and shredded coconut in a high speed blender until silky smooth, scraping down the sides and blending again as needed. Then, while on low, add the melted coconut oil, and blend again on high until smooth. Add the shredded coconut, pulse, then spread carefully on the jam layer. Sprinkle the coconut flakes on top, and place in the freezer for a few hours to set, or in the fridge overnight. Remove, slice, and enjoy! Keeps in the fridge for up to a week, or in the freezer for 2 months. 1 tsp maca powder (optional, trust me though…it’s fab with chocolate)! Start with preparing your base. Line a loaf pan (22x12 cm) with grease proof paper. In a food processor combine the ingredients for the base reserving a handful of raspberries to press into the base. I like the odd bit of texture but it should start to stick together in the processor bowl. Once you have reached your desired consistency, place into your prepared tray and press in the reserved raspberries. Put your brownie into the fridge while you make the cheesecake topping. Place them in your processor (no need to wash in between layers), with the rest of the ingredients. Process until smooth and creamy, you can also use a blender. Pour the cheesecake topping over the brownie and into the freezer to set, if you are wanting to eat it straight away. This makes quite a lot of cheesecake topping as it’s better made in larger quantities, I froze the remaining topping to use later. If not, you can let it set overnight in the fridge. 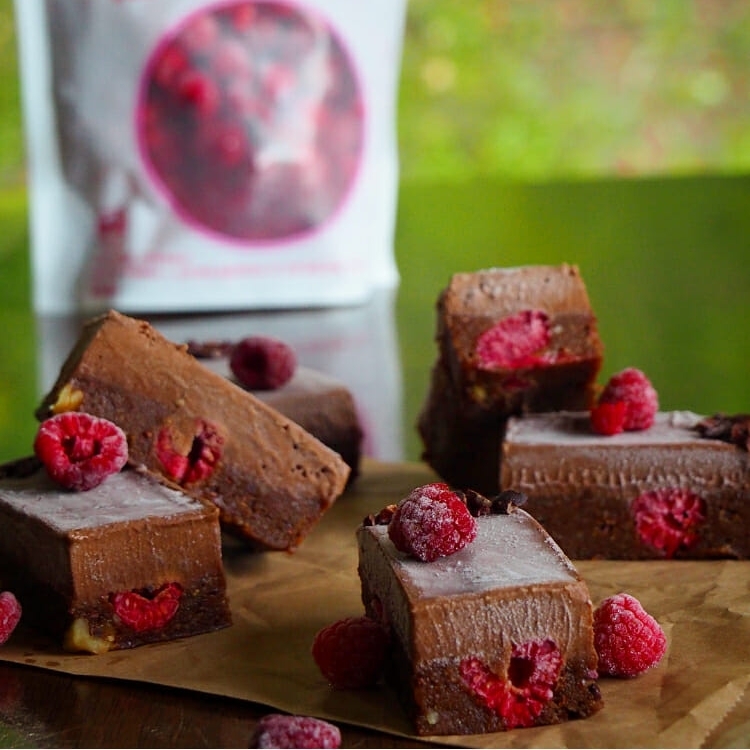 Once set, slice into 9 bars and decorate with cacao nibs and extra organic raspberries. .Note: these are yummy frozen too! Sort of like an ice cream sandwich. Mix honey, cinnamon, protein powder, and coconut milk together, until smooth. Stir in chia seeds until well combined (approx. 1 minute). Pour combined mixture into your chosen dish and set aside. Heat raspberries, water, and stevia, stirring generously to break up oob organic Frozen Raspberries. Simmer to reduce liquid. Stir through vanilla before removing from heat to cool. Spoon compote onto chia seed layer and sprinkle with coconut.